MAGNIFIQUE MAISON DE L'OCEANFRONT SUR LONG COVE. SITUÉ À 10 MINUTES DE MAHONE BAY, 20 MINUTES DE LUNENBERG. CET EMPLACEMENT EST IDÉAL POUR VISITER TOUS LES ENDROITS SUR LA RIVE SUD ET SE RELAXER SUR LE GRAND PONT, OU DOCK. VACANCES OU N'IMPORTE QUI VOULANT SE RETOURNER ET SE DÉTENDRE. Great location. Comfortable and convenient. Rarely do you come across a property that makes you seriously consider a major lifestyle change but this location started a lot of those conversations. Waking up and walking out to get coffee you are greeted by one of those views you usually see in paintings. The large windows which face the water makes it feel like you are on a boat on the cove. The property was very quiet and the house itself is very well done. It was an open floor plan with beautiful hardwood and great counter tops in a fully equipped kitchen.. Comfy beds and lovely linens and great air conditioning which sounds unnecessary but it was really warm for the first part of the week. Three bedrooms are hard to find and there was lots of room . The dock was fantastic and if you have a boat or small personal craft it would be very useful. The property has a large garage but it also has a long curving paved driveway so we just used that. The internet was very fast and Netflix was available. If you want there is a large outdoor patio with chairs and a fire pit. We really liked that the Trans Canada trail ran behind the property. This is an old railway line that runs for over 100 km/60 miles. It is in excellent shape and has a soft crushed stone base so running and walking were a pleasure. There were some people on bikes and they seemed to be having a great time. The trail runs through the forest past lakes and over bridges and was a great start to the day. We spent the afternoons exploring after lunch in Mahone Bay. Rebecca's and Oh my Cod were our favourite spots to eat. Great service and lots of tables outside and the fish was great. Lunenburg was close and made for a really nice afternoon. It was a busy little town but that added to the ambience of a beautiful summer afternoon. Overall a fantastic week. Leslie was a pleasure to deal with. We would love to come back in the Autumn for a longer stay and also would try it in winter. The skiing on the trail should be good. Highly recommended VRBO and we have stayed in many. We spent six days in this well appointed cottage and enjoyed the natural setting -waterfront on one of the South Shore's many coves- adjacent to the Dynamite trail, and within a very short drive to Mahone Bay, with its many pubs,coffee shops and quaint stores. We spotted a deer, a heron and scores of Canada Geese without straying from our deck. Wished we had brought kayaks because the cove is ideal for kayaking with its calm waters and there is a floating dock. Glorious beaches are within 30-45 minute drive both to the East -Hubbards Beach-, and to West, Sandollar, Hirtle's and especially Risser's Beach with its three kilometer sandy expanse and warm water. The cottage has a separate two-car garage which is nice to keep the car cool in the warm summer months. WiFi is good and there are two TVs with cable and a videoplayer. 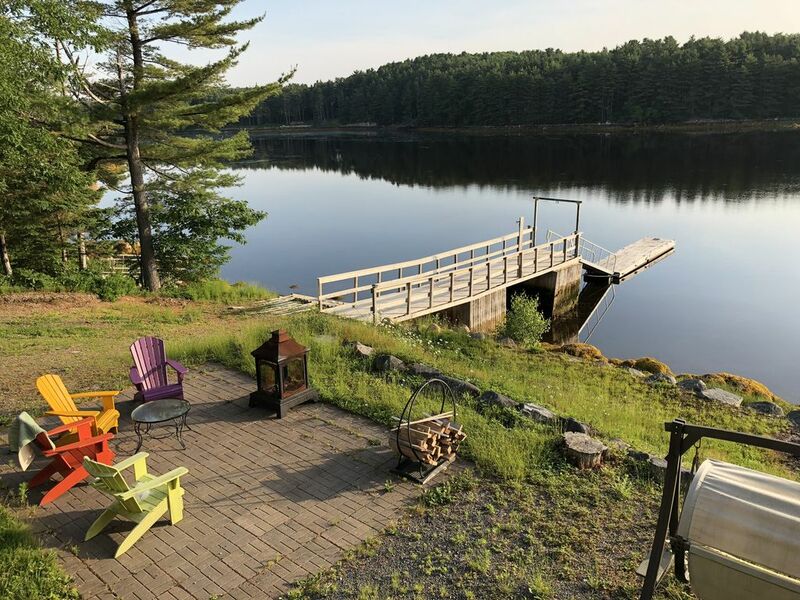 The house is as pictured with beautiful upper and lower decks, a barbecue and a table and armchairs on the upper deck and a fire pit on the lower deck, a tree swing, a rocking double seat and colorful Adirondack chairs. In short you have your pick whether you want to admire the scenery, chat or fall asleep. The decks provide shade for breakfast, or lunch al fresco (but come armed with insect repellent once twilight descends). The kitchen is well supplied with everything you will need whether you want to prepare an elaborate dinner or a simple barbecue. Bed linens and towels are tasteful and plentiful. There is a Jacuzzi tub with shower in the upstairs bathroom and a shower in the downstairs. Three couples is doable but two couples or a couple with children/and or a parent or in-law is ideal as there is a "master" bedroom upstairs and two bedrooms downstairs with their own sitting room. It is cool downstairs but the upstairs does get warm with the huge picture windows. (The owner was set to install air conditioning upon our departure). However the cottage would be equally enjoyable in the fall. All in all, if you like to wake up to birdsong and you seek clean air and the "simple life" but still require modern conveniences after a day of swimming, sailing or hiking this cottage would be a good choice.